Twenty-one years after the birth of the most famous of all Corsicans, Napoleon Bonaparte, a child named Giovanni Natale Santini was born on the "Island of Beauty". 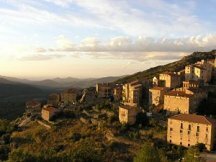 After spending his childhood in Lama, one of the most beautiful villages in the Corsican highlands, perched like an eagle's nest among the mountains, the young Santini left for the mainland in order to serve as a drummer in the Catagno battalion of the Corsican fusiliers, based at Antibes. He is not yet fourteen years old, and although he doesn't know it yet, his destiny is linked with that of the man who will shortly become his idol - Napoleon Bonaparte, Emperor of the French. With the transfer of his battalion to the famous military camp at Boulogne, Santini (as we shall call him from now on) gets his first sight of Napoleon. As Napoleon reviews the troops, the adolescent boy beats his drum with inexpressible passion, overcome by the vision before his eyes. Everything becomes clear to him: the only thing he has to offer this man on the magnificent white horse is his life. And that is exactly what he will give him. Santini participates courageously in all the wars of the Empire. He is present at Austerlitz, at Iena, at Eylau... From drummer, he is promoted to light infantryman of the 11th light, a position suited to his small, yet muscular frame. Not yet 22 years old by the time of the Russian campaign, he is already a respected veteran, with a wealth of campaign experience which impresses younger men. Although his lack of formal education prevents him from getting a well-deserved promotion, the abilities of this former drummer, who can scarcely read or write, do not go unnoticed and he is finally appointed to the position of imperial courier. The news overwhelms him with joy. From now on, he will be constantly at the side of his idol, the Emperor, and accompany him wherever he goes. But this is no time for rejoicing : it is the beginning of a descent into hell - the retreat from Russia, the defeat at Leipzig, the invasion of French territory, and finally, the farewell at Fontainebleau. The number of old campaigners who wish to accompany Napoleon into exile on Elba is large : unfortunately, not all of them can be accepted and Santini is not among those who are chosen. The brave Corsican thinks he will go mad : how can he keep on living if he is not allowed to serve his emperor ? He finally succeeds in persuading Bertrand, the Grand Marshal of the Palace, to take the decision to include him as an extra man and pays most of his own travel expenses. Upon his arrival at Porto Ferrajo, he is given responsibility for the "portefeuille", an honour of which he is fully conscious. He carries out his duties with exemplary zeal and discretion and soon becomes indispensable to Napoleon, who includes his name on the list of those who will follow him onto the bleak rocky outpost of his exile. For Waterloo has sealed the fate of the greatest leader which the world has ever known ; the English are determined to isolate their awkward prisoner. 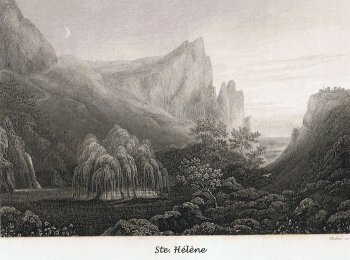 They exile Napoleon to the inhospitable island of Saint Helena, where he arrives on the seventeenth of October 1815. At first, the Emperor and his followers adapt as well as they can to this new life. But one of them is in particularly good spirits - Santini. How can he not be happy when he now has the opportunity to be so close to Napoleon ? What joy for him every time Napoleon addresses him in Corsican - he scarcely feels the ground beneath his feet. His one sorrow is to see how the signs of poverty are daily becoming more evident on the Emperor, and it is now that the hidden talents of this experienced campaigner become useful. A veteran of the Grande Armée, nobody can manage things better. He has mended his own tattered clothesso often, that his tailoring skills are honed to perfection. He is able to renew Napoleon's clothing by reversing the cloth, and he even makes him a new suit from an old grey frock-coat. He also turns his hand to shoemaking : he makes a pair of shoes from an old pair of boots, adds some buckles and lines them with white satin donated by Madame de Montholon. He roams the island and always returns with some extra meat to supplement their rations. 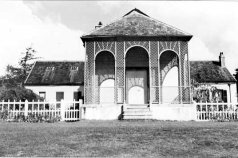 Life might have continued in this way, if the British cabinet had not had the unfortunate idea of appointing a new governor to Saint Helena. "I have seen Tartars, Cossacks, Kalmucks, but I have never before seen such a sinister and repulsive face. If such a man were to spend just one moment next to a cup of coffee, it would become undrinkable! Crime is engraved on his face." "Your Highness must be increasingly aware that our relationship with the governor will never be as satisfactory as we would wish it to be. In order to satisfy him, one must think, act and see things exactly as he does, accord with his fantasies, and agree with all his extravagances, paying no attention to what is happening here and limiting ourselves to ensuring that Bonaparte remains alive ; never set foot in Longwood, be at daggers drawn with all those who quarrel with him, whose number increases daily ; spy for him, faithfully report what is said to him, … and submit to the most humiliating interrogations. All this is incompatible with our position and our duties here, and even with our honour." In the face of the inhumane treatment meted out to Napoleon, Santini is gripped by feelings of intense hatred for the English garrison, and for Hudson Lowe in particular, whom he would willingly kill with his own hands. This idea takes such a hold of his mind that he comes to the point where he is ready to put his intention into action. For him, this simply means getting rid of a destructive, underhand individual, whom nobody, not even his own officers, will mourn. Once he has carried out this good deed, Santini intends to commit suicide, either by putting a pistol to his head or by throwing himself from a high cliff. Santini confides in the maître d'hôtel Cipriani, who, knowing exactly what his friend is capable of, goes to inform Napoleon of the planned assassination. Napoleon immediately calls for Santini and, in a voice of thunder, forbids him to carry out this irrevocable action. Then he brings him into his confidence : he tells him that the Emperor "would ask a service of him that is more important and more worthy of his great misfortune than the assassination of Hudson Lowe." 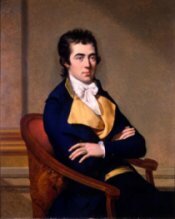 At the end of 1816, in the latest of a series of despicable actions, the British cabinetdecides to place further restrictions on the life of their famous prisoner. Lord Bathurst presents the new budget : the annual sum allocated for Longwood is to be reduced from 20,000 to 8,000 pounds. This effectively means that the Emperor is obliged to dismiss four of his companions - one officer and three servants. He designates Santini, along with Rousseau and Archambaud. And then he reveals Santini's mission to him-he must let all Europe know of the sordid conditions in which this most famous of exiles is being kept. To this end, the Emperor has drawn up a letter of protest in which he draws particular attention to the governor's unspeakable behavior. Knowing that he will be searched on his departure, not only does Santini take the precaution of hiding the precious document in the lining of his coat, he also learns the entire message, word for word, by heart. He is sent first to Cape Townwhere he is imprisoned for fifty days. (The reason for this is unknown). He finally embarks for England on board the Orontes and lands at Portsmouth on the 12th of February 1817 after a three month voyage. We can assume that he encountered some difficulties on arrival ; in addition, it cannot have been easy for him to set foot on enemy soil and mingle with a people he detests. But he sets out for London, anxious above all to fulfill the mission which he has been given. On arrival, he has to live by his wits for over a month, until his efforts finally bear fruit. Colonel Robert Wilson introduces him to Lord Holland, one of the leaders of the Whig Party in the House of Lords. Holland, a champion of civil liberties who has already protested against the exile of Napoleon on Saint Helena, reads the Emperor's letter of protest. The words reveal to him the truth of a situation which he had not suspected and he feels a sudden sense of shame to be English. On the 18th of March 1817, Holland, a man who is a friend to France and sympathetic towards the Emperor (like many others in England : it was only the cabinet whose behavior towards him was shameful) publishes "The Appeal to the English Nation (*) regarding the Treatment of Napoleon Bonaparte on the Island of Saint Helena." That same day, he puts an official question to Bathurst in the House of Lords, demanding that he be made to account for the actions which will darken his reputation for ever after. In the streets, people eagerly take copies of the appeal, which is re-printed seven times in ten days. From this point on, public opinion is firmly on the side of Napoleon's cause. As he awaits the outcome, Santini, who has become a hero despite himself, receives many visitors, to the dismay of the British officials. He is ordered to leave the country, to never again set foot on British soil and given a travel permit for Belgium. And so once again our hero sets out across the highways of Europe, armed this time not with a rifle but with a far more powerful weapon - the words written by the Emperor's hand. Faithful to his mission, he visits all the members of the imperial family and, even after the death of Napoleon, he continues to denounce the humiliating conditions in which his captors dared to keep this greatest of men. During these travels, which last for thirty-five years, he is continually harassed by European police forces who have been ordered to persecute Napoleon's messenger, the witness to the irredeemable guilt of the coalition. However, nothing can overcome Santini's determination and throughout his difficult course he receives many signs of encouragement ; among them is the news that the Emperor remembered him in his will (in a codicil of the 24th of April 1821) and left him a legacy of twenty-five thousand francs. Although Santini will never lay hands on this sum of money, he is deeply proud to know that Napoleon thought of him on his death-bed. The years pass and better days arrive when Napoleon's nephew takes up the imperial role. 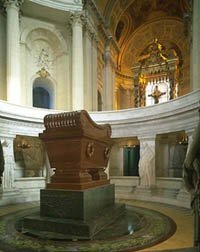 Napoleon III does not forget the loyal Santini : he entrusts him with the supreme honour of standing guard by the tomb at the Invalides. Pity the visitor who dares to keep his hat on his head by the tomb - a thunderous voice is heard to say "Remove your hat before the Emperor's tomb!" Among the many eminent people in the crowds which come to pay their tribute is the British Queen, Victoria, who does not hesitate to bow before the tomb of the man who was master of the world. Once more, during the twilight of his life, he is able to serve his master, even beyond the grave. A jealous guardian, he rises every day at dawn, eager to return to the final resting place of the man he has loved so much. Santini exults at the sight : he knows that Napoleon has won his last victory, the most important one of all, which is to unite the spirits of people around his name. In 1862, at the age of 72, the old campaigner breathes his last. And we can imagine that, eager to continue his service, he rejoined the Emperor on the Elysian Fields, to be welcomed by a guard of honour of those who fell for France. Santini, we honour you! And we honour all those who were loyal! (*) It was long believed that Santini was the author of this document, but we now know it was written by Colonel Francis Maceroni, a one-time aide-de-camp to Marshal Murat, based on material given to him by Santini and others about Napoleon’s condition.